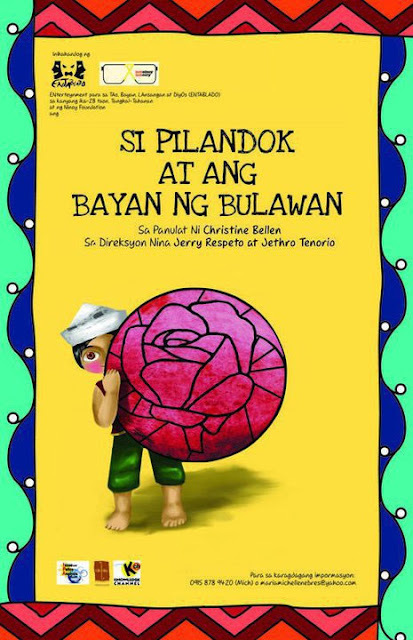 Entablado, the socio-political student theatre organization of the Ateneo de Manila University, opens its 28th season with Christine Bellen’s original Filipino musical “Si Pilandok at Ang Bayan ng Bulawan” at the Meralco Theater on Saturday, September 11, 2010 at 3 p.m. and 7 p.m. Inspired by the historical EDSA 1 People Power Revolution, the play uses a ‘kuwentong bayan’ framework to inspire unity geared towards nation-building. Pilandok, the trickster of Bayan ng Bulawan, tries to retrieve the bright star Bulawan from the clutches of the corrupt Datu Usman, and evil henchman Orochimaru. Pilandok seeks help from other villages; however, the individual efforts of conflicting heroes Pantas (Wisdom), Banal (Faith), Yumi (Beauty), Gara (Wealth) and Lakas (Strength) are in vain. When Pilandok finally confronts Datu Usman alone, the other villages join in to reclaim the bright star Bulawan. Ms. Bellen, known for the retelling of the Lola Basyang children’s stories and playwright of children’s plays, “Batang Rizal” and “Ang Unang Baboy sa Langit”, pens the musical. Dr. Jerry Respeto, known for directing and translating plays for the Philippine Educational Theater Association (PETA) and Dulaang UP (DUP), directs together with Ateneo professor Jethro Tenorio. Tuxqs Rotaquio of DUP designs the sets and costumes. Dr. Christine Muyco, UP Music professor, and Jema Pamintuan, Ateneo professor, compose the music. Dr. Respeto and Mr. Tenorio fuse the tradition and the modern for the play to be able to relate with the youth. “Dances are a mix of Asian and modern; conversations use the ‘old’ Filipino poetics and the popular ‘Taglish’,” says Dr. Tenorio. The play teaches and calls for everyone, young and old, to take part in creating a nation immersed in solidarity, trust and integrity that was inspired by People Power, and the life and death of Ninoy and Cory Aquino. Theatergoers are challenged to engage its society, and uphold values of justice and freedom. Proceeds from the musical will be for the Youth Leadership and Formation Program of the Ninoy and Cory Aquino Foundation (NCAF), and Tulong Dunong.